2001 Ford F-150 XLT Pickup, Triton 460 V-8 engine 117 K. 6595.00. Full power equipment, towing package. It has a 2,000.00 + fiberglass topper . 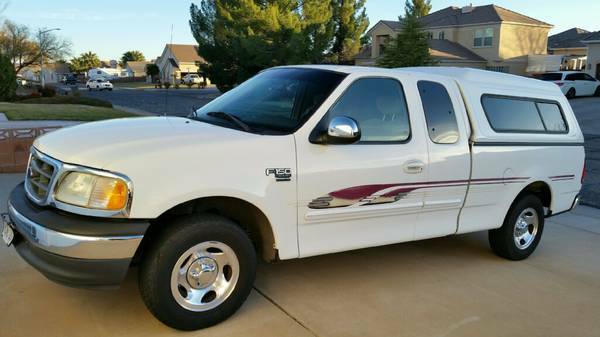 Seats are like new, Vehicle is very clean and has been well maintained. The motor runs smooth, drives great. I have used full synthetic oil in the motor since I have owned it. Paint and dash is not sun damaged. The dash has always had a dash protector on it. The color white is perfect for Southern Utah. This truck has been a very dependable and outstanding vehicle. You will be impressed when you see it and drive. Cash only.